The themes that emerged from the Republican National Convention were executive leadership, immigrants coming to America to find success, entrepreneurship, how free markets are better than entitlements and government dependence for minorities and women, and a leadership and problem solving style that is results oriented. We are committed to all people. We do believe you can use government in a good way. 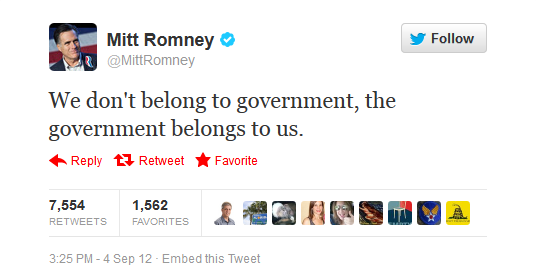 Government is the only thing we all belong to. We're [in] different churches, different clubs, but we're all together as a part of our city or our county or our state. And our nation. The negative reaction to this video has been coming fast and furious from all corners of the blogsophere, and with good reason. As of mid day Wednesday, the video has been seen almost 145,000 times, with under 200 likes and over 3000 dislikes. The comments on the youtube post are overwhelmingly negative. The DNC could not have made it more clear where they stand. Indeed, I've blogged previously about the nakedly marxist nature of Obama's utterances, and they now appear to be doubling down on the populist, collectivist, shared sacrifice, spread the wealth around, at some point you've made enough money message. So, from a pragmatic economic standpoint, you have a choice between someone who believes in the power of the individual to succeed on his or her own, regardless of race, and someone who believes that the state is all powerful and is more important than the individual. If you're a small business owner, which approach sounds more likely to promote your success? Sometimes, they make it too easy for us. After the all star lineup from Tampa last week, one wonders how Conservatives ever lose elections in this country. A complete and total scam. It's only because they got caught that they put them back in. I can only wait to see what other changes are still waiting to be found out.